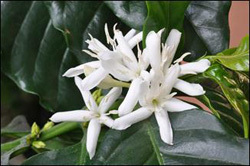 White starry flowers in spring form in clusters along branches having a strong Jasmine like fragrance, followed by green, coffee cherries. 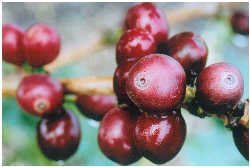 The coffee cherries turn bright red for Christmas, ready to harvest. 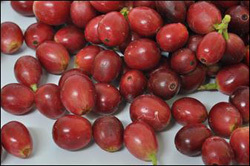 Each Cherry contains 2 seeds (beans). Habit - A cone shaped, shallow rooting shrub. Evergreen with glossy green lanceolate leaves up to 20cm long. 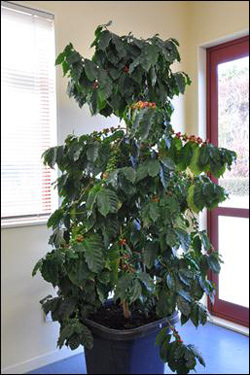 Size - The coffee plant will grow to 2-5m with a vertical central leader and horizontal branches. 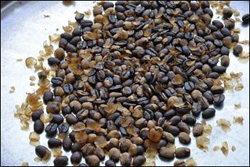 Harvest - Coffee takes 3-4 years to fruit. 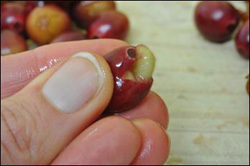 Harvest your coffee cherry when dark red. 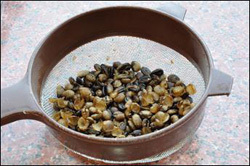 Soak to remove skin and dry in the sun and then separate the seed from the cherry by breaking away the husk. 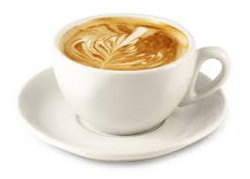 Plant your coffee in a decorative container slightly larger than the container you brought it in. Use a good potting mix and water in well. Position in your house that is not in direct sunlight. During winter let soil dry out then water but in the summer water regular to keep the soil moist. Feed with general slow release fertiliser in spring and again in summer. 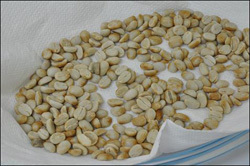 Grow yourself a beautiful coffee plant and you can roast your own coffee made with your own hands. 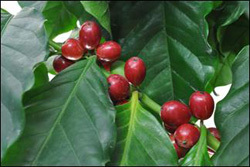 Coffee plants have glossy green leaves and make an ideal house plant. NZ is too cool through the winter to grow it outside. 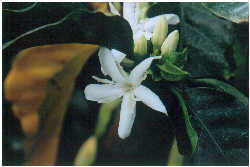 In the summer your coffee plant will be covered in fragrant flowers smelling of jasmine. Every flower becomes a cherry and grows through the year turning from green to red. A picture to behold – very Christmassy. 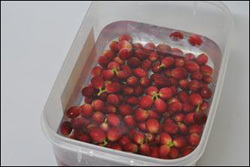 Collect the deep red cherries and soaked them in water overnight. This allows the cherries to give up the beans, easily the next morning. Back into the water to ferment where natural enzymes break down the slippery layer and remove it. This will take a couple of days. The beans are dried on a paper towel in a sunny window. 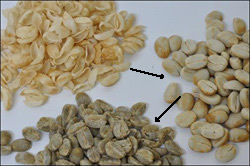 The beans need to loose 90% of their moisture. 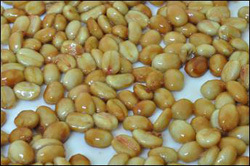 Test this by biting into a bean and if it is still soft and chewy place back in the sun to dry until hard and dry. Next remove what is called the Parchment – a thin paper skin. A little labour intensive with your fingers but relaxing. You can use a food processor with a plastic blade to speed this process up. 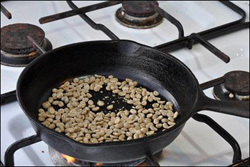 Once the parchment is removed you have beans with a silver skin on them and this does not need to be removed to be roasted. 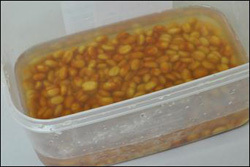 At this stage you can store your beans in a sealed air tight container and roast as required. 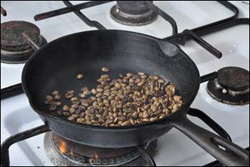 To roast use a cast iron frying pan and put on with the extractor fan. We do not want the smoke alarms going off. Once the pan is smoking in go the beans. Kept them moving and slowly they will change colour and start to make a cracking noise. 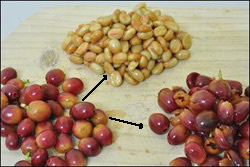 As the beans loose moisture and caramelise the darker they go. I took them off the heat when they were brown for a medium roast. 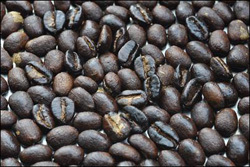 But experiment for the fullness and strength of your coffee taste choosing between a light brown for a mild taste to black beans for a strong flavour. 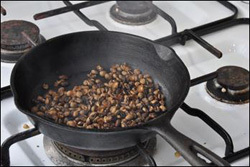 Once off the heat turn the beans into a metal colander and keep them moving to cool them down. Once cool enough use your fingers to help remove the silver skin. Gently blow on them to blow away the skins – outside of course. Into your food processor and grind away, it is very noisy!! Once fine enough into the coffee maker. Not long and you will be sipping delicious coffee made with your own hands. Not so difficult to make the No 1 drug in the world and it is legal! 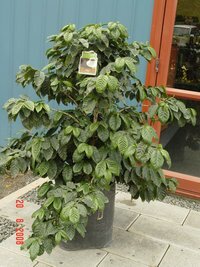 All you need is a beautiful coffee plant, your kitchen and yourself.